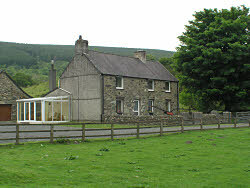 This comfortably furnished self catering farmhouse is set in an attractive valley to the west of Snowdon. The accommodation was completely refurbished in 2002, and includes a sauna and games room. There are 5 bedrooms (1 single, 1 twin, 2 double, and one with bunks), and 2 bathrooms (1 upstairs and 1 downstairs) - one of which has an electric shower. There is a kitchen, utility/storage room, and a conservatory with seating and stunning views of the mountains. There are 2 lounges (both with mountain views), one of which features a woodburning stove for keeping warm on crisp winter evenings. There is an enclosed area to the front of the house, and a large enclosed sunny garden to the rear with a stream (unfenced). Up to 2 well behaved dogs are allowed. One of the outbuildings has been converted into a games room with table tennis, a pool table, darts board, and cycle storage. There is also a sauna (for adults use only) in the games room - great for relaxation. 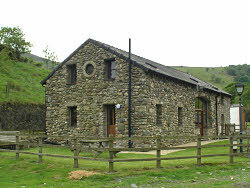 This comfortably furnished self catering cottage is set in an attractive valley to the west of Snowdon. 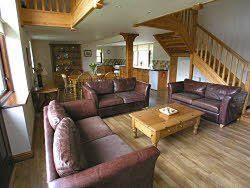 The accommodation was tastefully converted from a stone built barn in 2005, and was extended for the 2012 season. There are 4 bedrooms (2 twin, and 2 double), and 2 bathrooms. 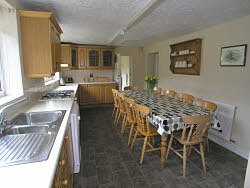 The ground floor of the cottage has open plan kitchen, dining and lounge areas. There is also a utility room, twin bedroom and bathroom. Upstairs there are 2 double bedrooms, a twin bedroom, and a bathroom. There is a private fenced area to the front of the cottage with views of the surrounding countryside. There is a hot tub which is exclusively for the use of the guests staying in Hen Ysgubor (only available until 8pm and for adults only).